The heavens opened up yesterday and it poured and poured and poured in Delhi. 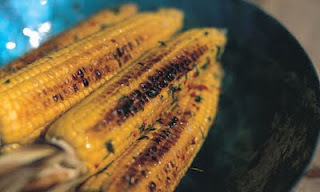 Once it stopped raining, I saw many bhutta (corn on the cob) sellers around the park infront of my house. Some squatting on the road and some with push carts; all surrounded by people and doing a very brisk trade. They seemed to have sprung out of nowhere as if intuitively knowing that people will queue up to buy bhuttas once the downpour ends. Personally I think rains and Bhuttas are meant to go together. So I bought myself a Bhutta and ate it piping hot and spicy as I strolled through the park. Now this park is a schleduded area sheltered by huge Gulmohar and Neem trees.It’s like a personal park for the few flats that surround it. In the evening it’s filled with aunties sitting on benches and gossiping, kids playing on the swings or people like me trying to jog. So there I was strolling unconcernedly and eating my bhutta when the ladies sitting on the bench spied me. The sight of me eating a bhutta sparked off a discussion on various recipes involving corn. On an impulse one of the elderly neighbors asked her husband to get a few bhuttas so that she could roast them in the microwave. I stopped to talk to one of the kids playing on the swings and she asked her mom if she could have a bhutta too. Suddenly all the kids wanted to eat bhuttas and started pestering their maids/moms for them. The bhutta seller was called over with his cart and soon all the kids and most of the moms were clamoring around him. By this time I had finished my bhutta and was geared up to start my evening jogging session. Meanwhile the elderly neighbors had bought their bhuttas,microwaved them, cut them into little pieces, added lemon and spice to them and were now offering them to everyone in the park. They offered me some and when I politely declined saying that I had just eaten one, they said “c mon eat it after all you are the one who has sparked off this Bhutta eating epidemic today! Inspite of yesterdays rain its a really hot day. Perhaps today I should walk through the park with an ice cream in hand! heh heh..Bhutta seller must have really blessed you. @Preeti - I did! I never can resist Bhuttas ! @Swaram - U bet they are !